Fences have more purpose and meaning than you think. They’ve played a pivotal role in classic literature, films, and TV shows where they were either an important prop that moved the plot forward or symbolic of a major theme. While we may pass our neighbour’s fence without giving it a thought, these famous props demonstrate that fences reveal a lot more about people than we realize. In The Sandlot, a ragtag group of nine teenagers play baseball next to a mysterious old man’s house that has a sandlot. The house has a ferocious dog in the backyard ominously labelled as “The Beast.” The newest member of the ragtag team is Scotty Smalls. He’s told of the neighbourhood legends and rumours surrounding the “The Beast” and its owner after he attempts to retrieve a baseball that was accidentally sent into the fenced-off sandlot where “The Beast” lives. The only thing separating the boys from “The Beast” was a rickety old fence made from wood and plastic. Eventually, Scotty gains the courage to scale the fence and confront “The Beast” and its owner to retrieve the precious ball. Scotty discovers that the stories were exaggerated; “The Beast” is not ferocious and its owner was, as it happens, a retired baseball player. It acted as a temporary barrier to protect the property and “The Beast” from trespassers. It stimulated the kids’ imaginations and fueled their fears because they were faced with the unknown territory that lay beyond the fence. In The Adventures of Tom Sawyer by Mark Twain, a classic novel later adapted into a film, one of its most famous scenes involves a fence. After skipping school one afternoon, Tom Sawyer is sentenced by his Aunt Polly to a punishment of whitewashing a picket fence that is 27.4 metres long and 9 feet high. Rather than accepting his fate, our hero takes action. Convincing some other boys passing by that his gruelling task is actually fun, Tom offloads his work onto an unsuspecting group of young men. Moreover, Tom manages to get them to pay him for the opportunity. Now, why is this scene so important? The fence became a valuable tool, which Tom used to turn his labour into an enviable task. He developed his creativity and skills of persuasion, profiting from both. Still don’t believe that this scene is as important as we say? 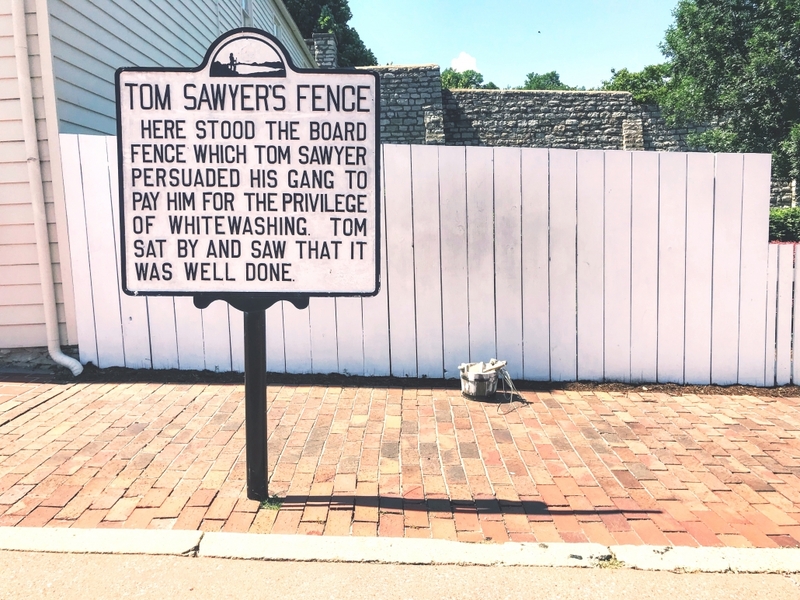 You’ll find that an image of the fence scene appears in most editions of The Adventures of Tom Sawyer, as it became a pivotal representation of boyhood in nineteenth-century America. On the 90s sitcom Home Improvement, Tim Taylor was one of TV’s great examples of a “guy’s guy” who—while in over his head—meant well, and always tried to do right by his family. While searching for answers on how to better relate to his wife and kids, Tim often sought refuge in his backyard and the advice of his neighbour, Wilson. Wilson always dispensed sage advice from behind a picket fence, his face always partially hidden. The fence added a layer of mystique to Wilson, making his advice seem wiser. Having a custom fence, such as a PVC fence with lattice, between you and your neighbour may not make their advice seem better, but it might provide a good backdrop for some interesting backyard conversations. And who knows? Maybe they’ll look at you as their Wilson! In the film Doc Hollywood, Michael J. Fox plays a hotshot plastic surgeon on a cross-country drive to Beverly Hills. While going through the back roads of South Carolina, he crashes his Porsche into a fence that’s in the process of being built by the local judge’s own two hands. Fox’s character is punished with community service, which consists of being the general practitioner for the town. He realizes what is truly valuable in life the longer he stays in the town and interacts with the people. The damage of the hand-made fence made by the fancy car demonstrates the clashing of superficiality and genuine humanity. Building your own fence is a great way to respect your home and yard. Knowing you poured your blood, sweat, and tears into your fence gives you a sense of accomplishment and pride, ensuring you’ll have a great fence for years to come! Choosing the right fence for your property should carry meaning. Consult CAN Supply Wholesale for more information on our PVC vinyl fences or call us today at 1-844-932-2680! Top Seven Fence-Loving Plants for Plant Hardiness Zone 3 Should You Hire a Fence Contractor or Go the DIY Route?